This is our Newsletter of 4 April 2019. If you’d like to receive a weekly round-up into your inbox, just sign up here. Exciting news! GRUB will be hosting a monthly weekend food fair on Regent Trading Estate. 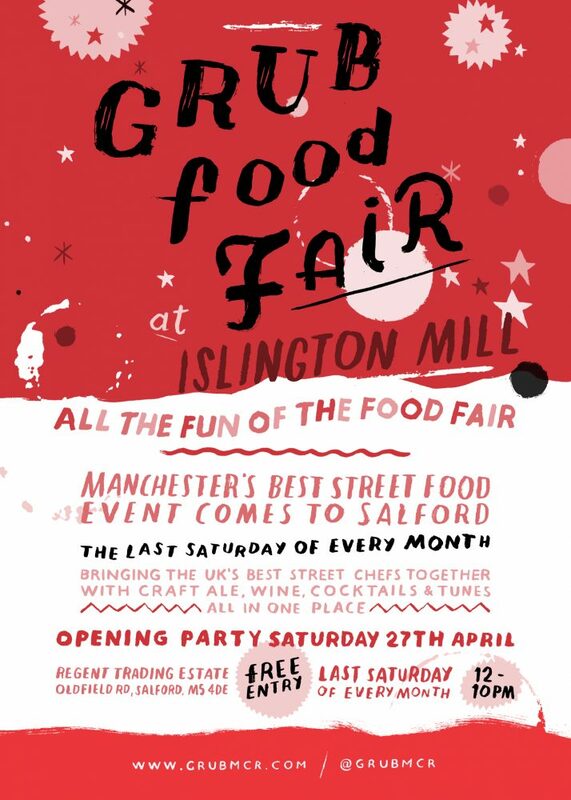 The regular food and drink event launches on Saturday 27 April and runs from 12pm till 10pm. With different leading street-food vendors on rotation and the finest cocktails and crafty things to drink, it’s a free get-together to showcase the finest grub around. See you at the launch. // 17 April: Islington Mill Art Academy and friends invite you for a day-trip to Bradford as part of their programme of public events. Taking in Cartwright Hall / Hockney Gallery, The Media Museum, The Peace Museum and The Brick Box, the trip will include chats with artists and curators and is free (just travel and lunch to cover). All welcome for a day of artistic sightseeing! // 24 April: More IMAA activity as the group present a Thursday Late event at the Whitworth responding to the current John Ruskin programme at the gallery, including drawing workshop and conversation. Read more here. // Throughout April and May: Salford Makers have a hectic creative schedule of workshops, including printing with nature, jacket making workshops, jewellery and gel plate printing. The full line-up of classes is on our Event page, get involved..! // Afterlifes by Hannah Farrell at Caustic Coastal is open Thursdays & Saturdays 1-5pm until the end of April. // See the FULL LINE-UP for Sounds From The Other City for Quindecennial on 5 May. 15 promoters celebrate 15 years of Salford’s most beloved music and art festival. // 7 Spot Pottery have a great line-up of classes and workshops for many skill-levels. Event pages and sign up here. // PROFORMA launch new discussion series ‘Curating Movement’ with leading North West Contemporary Art Curators and Artists.